On June 6th 2015 AZAB will start, a race for single and two handed crews. The race consists of two legs: from Falmouth to Ponte Delgada on the island São Miguel, the Azores, and return. Initially the plan was to sail with VANDAL, a VQ32. At the beginning of May we sailed her from Shetland through the Hebrides and the Irish Sea to Falmouth. During this beautifull trip we realized that some important things were not working as they should have done. Since time was short to get everything sorted, we decided in Falmouth not to start the race. Back in Lelystad I decided to enter with JAGER since the AZAB is a good race to test things and to see what works on the ocean with a small crew. It is also good competition! The basic design of No 494 is ready. It worked fast and pleasant. I only had to make the basic drawings. The yacht will be built in America. The layout shows a technical part with engine and storage in the aft. Divided by a watertight bulkhead, the interior starts with galley and bathroom. There is a raised seat on starboard with a sea berth and nav table. From here there is a reasonable view around. Forward there are 2 seperate cabins with more storage forward of another watertight bulkhead. To check plate expansions I most often make a half model. It is an easy way to see if all markings are right. All lines are printed on a foil that runs over the mdf frames. 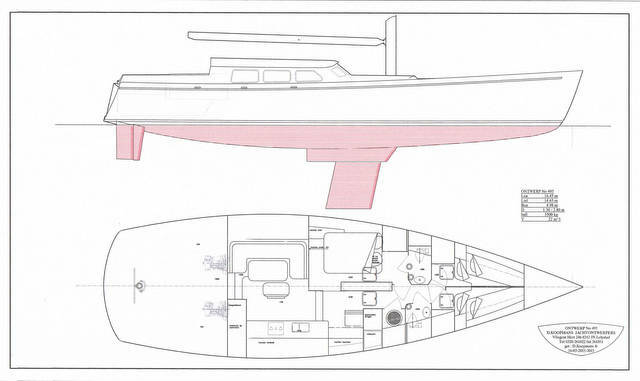 After the AZAB race I will start with design 495, now a sketch design although already with faired hull and deck. 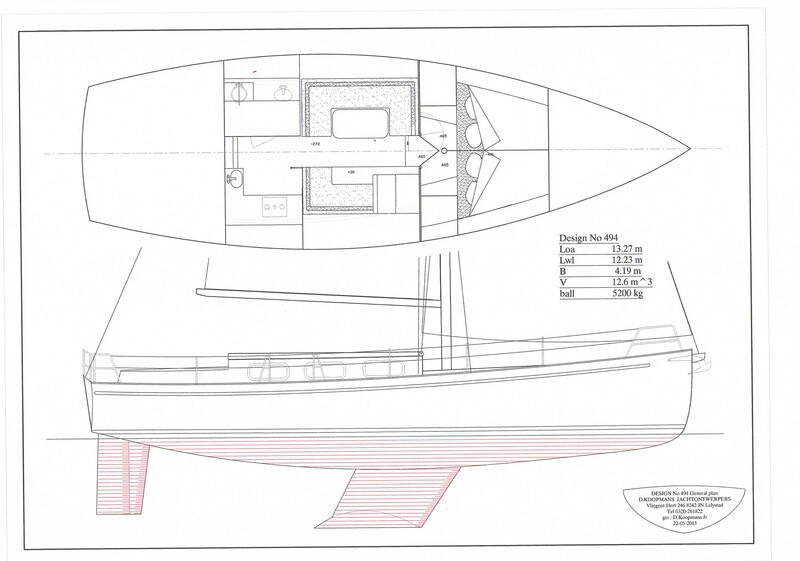 She will be built in steel with lift keel, double rudder and double engines.